Since the last time I wrote, the Hulk--my favorite fictional character, as you should know if you've been following me for any length--largely remained dead since Marvel had him killed in their publicity stunt masquerading as event series, Civil War II, in mid-2016. The series was written by Brian Michael Bendis, a writer whose work I've at times enjoyed (Alias, Daredevil, Ultimate Spider-Man--the first 50-ish issues) and other times loathed (gobs of Avengers and X-Men of varying flavors; Secret Invasion; Guardians of the Galaxy). As I've said before, his characterization of Banner and the Hulk just leave me cold, and each time I have to read something he wrote about them, I cringe at the total lack of knowledge of and utter disgust for them he seems to possess. I know not everyone holds Bruce Banner and his monstrous id in the same high regard as I, but dammit, do people who seem to outright hate him need to be so obvious about it? The only thing more disgusting than the way in which Marvel chose to kill the Hulk is the way in which they've teased, time and again, his "resurrection." It's true that you knew they would never let him stay dead, but really, they tease by having the Uncanny Avengers fight a version of him apparently raised by the Hand and wearing tatami that still lets his green skin peek out around the edges? Not content with that, Banner's body is then turned over to Captain America, who at the time was a deep cover Hydra agent, his memories rewritten by the Cosmic Cube as part of a revenge scheme by the Red Skull. (Say that five times fast, I dare you!) Of course, Captain America Hydra turns the corpse over to Arnim Zola, who programs him to return to life just long enough to shred through Cap's heroic opposition like a sickle through chaff. 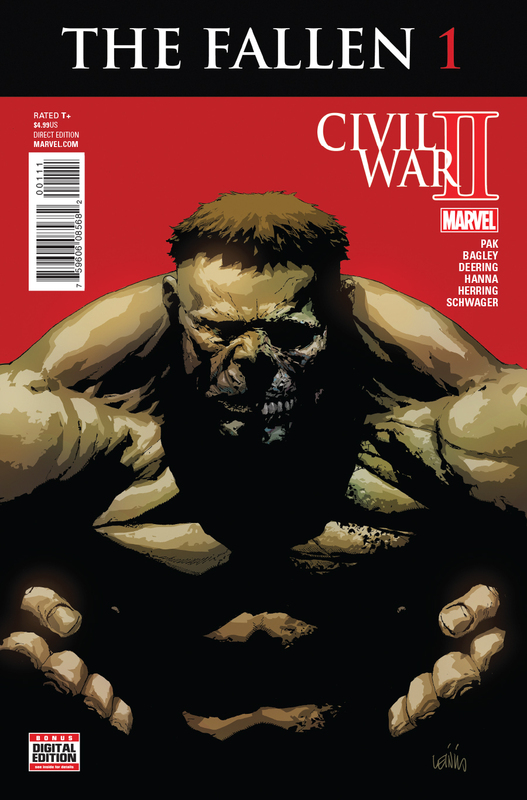 So of course, primed by these three "deaths," the new Hulk status quo is that he's--wait for it--immortal, and each time he's died, he was just destined to come back. That's the premise of the new series by Al Ewing and Joe Bennett, coming in June to a comic shop near you, called--yup--The Immortal Hulk. (Interview at link.) And Marvel is previewing this new take in their 16-part weekly series, Avengers: No Surrender, of which issue #684 is now on sale.